When you’ve lived for a long time and are well traveled, your story can get complicated, be misrepresented by others, or if you’re really lucky, become the thing of legends. That’s the case with denim. In today’s world, denim is a modern-yet-classic, fashionable-yet-casual staple in almost everybody’s life. Many think of their favorite pair of jeans as a faithful friend. But for a long time, denim was reserved for the workers—tradespeople, miners, ranchers, for instance—who needed a durable, long-lasting fabric. It eventually rose to the iconic fashionable status it now holds, but not without some ingenuity and controversy along the way. Though it has a similar weave, serge is made from wool, whereas denim has always been constructed from cotton, with a weft that passes under two or more warp threads. 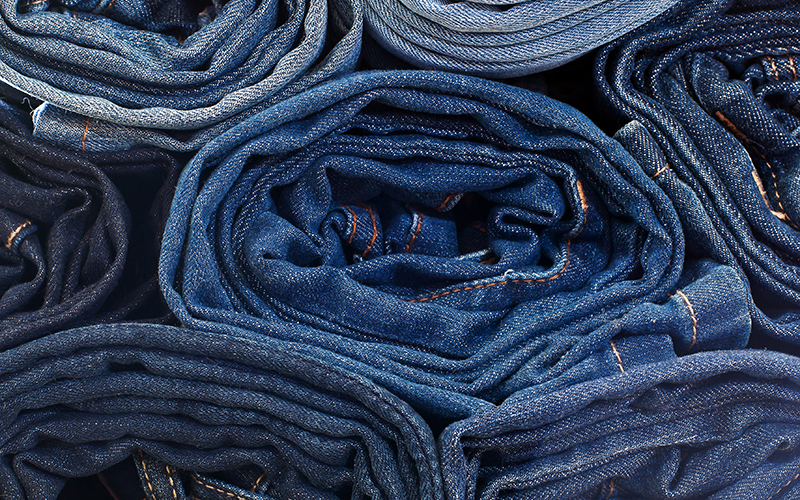 Denim came to North America during the rise of the textile mills in the 18th century. At the time, jeans were already being produced, but not exclusively from denim. Other fabrics such as dungaree were being used. “Jeans” had become more of a catchall term for trousers. The term is said to have derived from the French word for Genoa, Italy, where the first set of trousers was made. The story of the modern-day blue jean begins in the mid to late 19th century when Nevada tailor Jacob Davis began making work pants with rivets, which reinforced the fabric and made it stronger for workers who were tough on their clothing. The man supplying the fabric was dry goods wholesaler Levi Strauss, who’d gone west allegedly to expand his family’s business. The pants became popular among miners in California, and Davis reportedly contacted Strauss sometime in the 1870s to discuss patenting the product. That eventually happened, and “blue jeans” as we know them were officially created. The popularity of denim steadily rose through the 20th century, as word of mouth spread and blue jeans became available nationwide. Soldiers embraced denim, increasing its visibility in the public eye. In the 1950s, denim was thrust into the limelight when James Dean wore blue jeans in “Rebel Without a Cause” and they went from a factory worker’s uniform to the preferred pants of the greaser subculture. But not everyone embraced the trend. It was thought by some to be the marker of rebellious youth and was banned in many school dress codes until the 1970s. Another popular subculture popularized the pants: the hippie counterculture of the 1960s. Jeans became the clothing of choice for many of these youth and, as a result, became a more common part of everyday life. Denim eventually became so embedded in society that it even survived the synthetic fabric phase of the 1970s. Today, jeans are the go-to pants for many Americans. They come in a variety of styles and are seen everywhere—in schools, on the runway, and in the workplace. Today, denim has reached an iconic status in fashion, and no one can imagine a life without blue jeans. But that doesn’t mean the fabric has stopped evolving. Throughout its lifetime, denim has mirrored the attitudes and current events of the time. Today’s evolution embodies a desire for pure, honestly good, environmentally friendly fabrics. For decades, conventional cotton has been grown using pesticides and chemicals and is credited with using as much as 25 percent of the world’s insecticides. Close to 90 percent of conventionally grown cotton in the USA is genetically engineered. Not only are these growing practices harmful to American farmers, but because denim is largely produced overseas, where labor laws are much looser, chemicals used in processing the fabric pollute small communities, and synthetic dyes used to color it are dumped into waterways. Organic cotton is the wave of the future, and nobody is embracing that future more than Eileen Fisher. This forward-thinking company produces denim from organic cotton that is grown without pesticides and is part of a balanced ecosystem. Available in skinny, straight, or boyfriend styles, these jeans are better for you, better for workers, and better for the earth. Without pesticides, plants harm fewer insect and animal species, make better use of water inputs, and better withstand droughts. Precious water is preserved, and precious lives are. too. The because the company also makes many of its jeans using dyed yarn that is free from harmful substances, Eileen Fisher is working toward increasing the reach of those mindful practices. This type of ecofriendly fashion ensures denim will maintain its popularity and iconic status for decades to come, and that Americans will be happier and healthier for it. 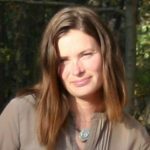 Toni Becker is a part-time content creator at Rodale’s. She is also the personal chef, event planner, chauffeur, and best of all playmate to her young daughter. Her family of three lives in the woods where she finds time to write, cook anything she can from scratch, garden, and build her case of why she needs goats. I can add an anecdote/legend to the story. I moved to San Francisco in the mid-70’s, and they had just opened the Levi’s museum in a beautiful wooden western building on Valencia Street. I’m not sure it’s still there. The curator was an elderly man who started working there when he was 10 (in the 19th Century!) as a stock boy for buttons and rivets. The building was on my (walking) way back from work, so I would often stop there. If there was no one else there, and there generally wasn’t, I would spend hours talking to him. Now of course memories change over time, and I’m retelling what I recall from conversations held forty years ago. He, in turn, was telling stories he’d heard as a child, from the original actors. But apparently Davis’s innovation was adding rivets. Levi-Strauss’s innovation was making the denim blue. And that’s the interesting additional point of the story. During the gold rush, there was a whole fleet of abandoned ships in San Francisco harbor. Old fotos will attest to that, and it’s eerie. Ships would stop in at the port on their travels between the East Coast, around the Cape, and Asia, across the Pacific. On hearing of the gold in the mountains, the entire crew would abandon ship and head for the mines. The ships were left to rot, their cargoes abandoned or sold at a pittance by folks who didn’t really own it. So that’s how a shipload of Indigo dye was stranded in the Bay, heading from Asia to New York and beyond to Europe. As a marketing strategy, Levi-Strauss decided to dye an entire batch of the conventional tan or kakhi denim which was then being used, and to call them “blue jeans”. Levi’s may not have been the first denim jeans, or even the first riveted ones, but they were the first blue ones.